Ever wonder about some of the oldest existing buildings and structures in Toronto, Ontario? Well, Wikipedia created a list of them that were constructed before 1920. The red-brick Gooderham Building is a recognizable historic landmark of Downtown Toronto located at 49 Wellington Street East. On the eastern edge of the city’s Financial District (east of Yonge Street), it is in the St. Lawrence neighbourhood wedged between Front Street and Wellington Street, where they join up to form a triangular intersection. Completed in 1892, it was an early example of a prominent flatiron building. Built by architect David Roberts, Jr. and originally cost $18,000 to construct for distiller George Gooderham Sr. (1830–1905), son of Gooderham and Worts distillery founder William Gooderham. It was the office of the Gooderham & Worts distillery until 1952, and sold by the Gooderham Estate in 1957. Bought in 1975 and saved and partially restored by David Walsh and Robert Phillips, further restoration took place in 1998 by owners Michael and Anne Tippin. The building was declared a historic site under the Ontario Heritage Act in 1975, and then in 1977 the Ontario Heritage Trust attained a Heritage Easement. Currently (2011), it is owned and managed by the Woodcliffe Corporation. On 12 October 2011, Woodcliffe Corporation announced that it would be selling the building. The building was last sold for $10.1 million in 2005, and for $2.2 million in 1999. The building is currently owned and managed by The Commercial Realty Group. 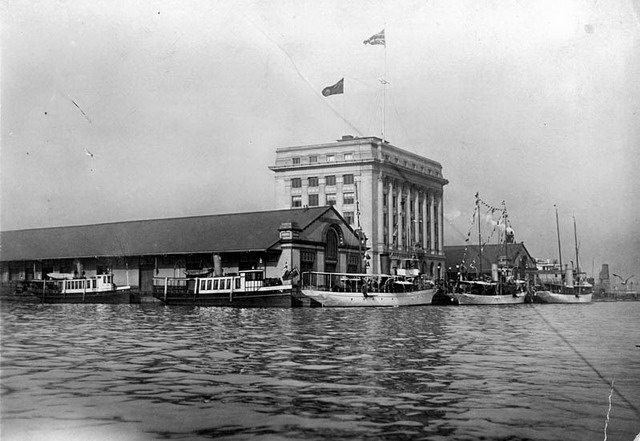 The Black and White picture, shows Steamship Lines Marine Terminal Warehouses and Toronto Harbour Commission Administration Building, taken September 22, 1920, by Arthur Beales. Toronto Port Authority Archives, PC 1/1/5629. The colour picture above is of the Toronto Harbour Commission Building as it sits today, and showing that it is now landlocked. By the mid 1920s the harbour was being filled in as part of the building boom in downtown Toronto and the shoreline became further and further from the building. This building today is probably more famous for its high-end Restaurant Harbour Sixty.